Whitfield School students, faculty & staff are once again participating in the 100 Neediest Cases program through the United Way. This year, the Whitfield community will help 40 families! Each Whitfield advisory is assigned one family and non-advising faculty & staff will contribute gifts to four families. For generations, the 100 Neediest Cases campaign has helped thousands of families and individuals during the holidays throughout the St. Louis region. The 100 Neediest Cases tradition began in the 1920s when the Christmas festival provided dinner and toys for those in need. United Way of Greater St. Louis and The Post-Dispatch have partnered for more than five decades, renaming the campaign 100 Neediest Cases in 1954. As a part of this year’s kickoff, Madeline Sowatsky (pictured), resource and support manager with Big Brothers Big Sisters of Eastern Missouri (BBBSEMO), was a guest speaker at today’s Morning Assembly. 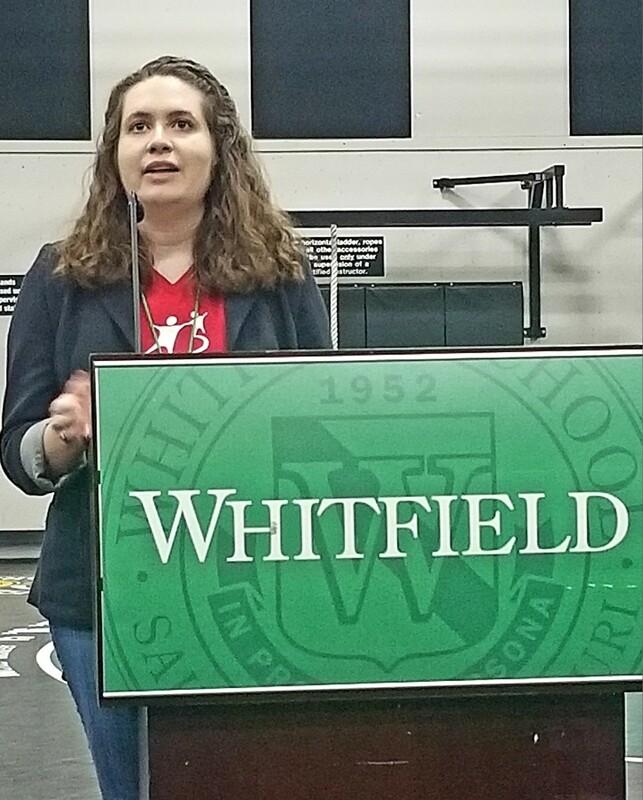 Ms. Sowatsky shared several inspirational impact stories from BBBSEMO clients and thanked the Whitfield community for our generosity and continued support.